Asparagus consists of ca 90% of water and has a significant amount of Vitamin C. Asparagus was known in the ancient Greece. The English word originates from Latin and that from Greek. It is remarkable that according to some sources the old Egyptians laid boxes of asparagus into the tombs. In my recent research among my friends and colleagues in different countries on which asparagus people preferred the green one seemed to be the winner. I have tried now to understand the white asparagus more. Both white and green when not overcooked taste good, however I have found a reason why I personally like the green one better. Namely in the mouth the white asparagus seems to break lengthwise when biting into it and the green one easily across or in any direction that I want . Therefore the white one is more difficult to bite into pieces. 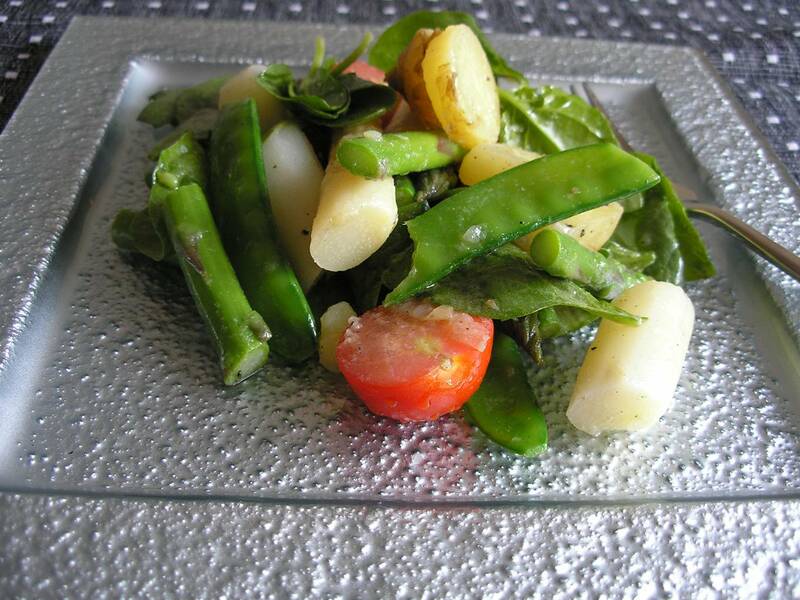 While the asparagus season lasts here is another recipe. This time combined with the new potatoes that are in season at the same time and available from the local producers. The quantities here are just indicative. Making your own mix adding more of one or the other ingredient is the way to make this salad. The new potatoes have a very thin peel and can be eaten with the peel. Bring the water to boil add salt (1 teaspoon) to the cooking water and boil the potatoes as usual. Prepare the asparagus by peeling the white asparagus thoroughly. The green asparagus has a soft skin and no need to peel it. Cut the spears into 3-4 cm long pieces. In a separate pan bring water to boil and add some salt to it. First blanch the mangetout (2min) or sugarsnap peas for about 3 minutes. They should be cooked, but not too soft. Take out into a bowl of cold water to stop them cooking further. Now add the white asparagus into the same boiling water and cook for ca 2-3 minutes. Add the green asparagus and cook for 1 minute. Take them out into the bowl of cold water. Halve the tomatoes. Cut the still warm potatoes into slices as thick or thin as you prefer. 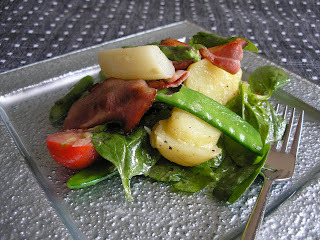 Add the washed spinach leaves, asparagus and the mangetout into the salad bowl and mix with the sauce. For the sauce mix all ingredients together and leave for 10 minutes before adding to the salad. Enjoy as a stand alone meal or a side dish. If pure vegetarian is not your cup of tea, try with a couple of pieces of fried bacon to add a meaty taste to it.